One of the prettiest I know in West Sussex. The setting is lovely: You look up to the slope of the South Downs on the east side. The River Arun and the wild brooks are on the on the south and west sides. The village has its own castle – in use as a hotel and wedding venue. Even if you are not staying at the hotel you can walk around the back of the building on your way into the wild brooks. Whilst you are in the area do visit the Pulborough Brooks. This is an Royal Society for the Protection of Birds (RSPB) site – open throughout the year and a haven for birds. This area often floods in the winter. Another place to see is the Working Museum. This is an interesting use of an old chalk pit above the railway station which is now home to old agricultural and industrial machinery, nearly all of it still functioning. 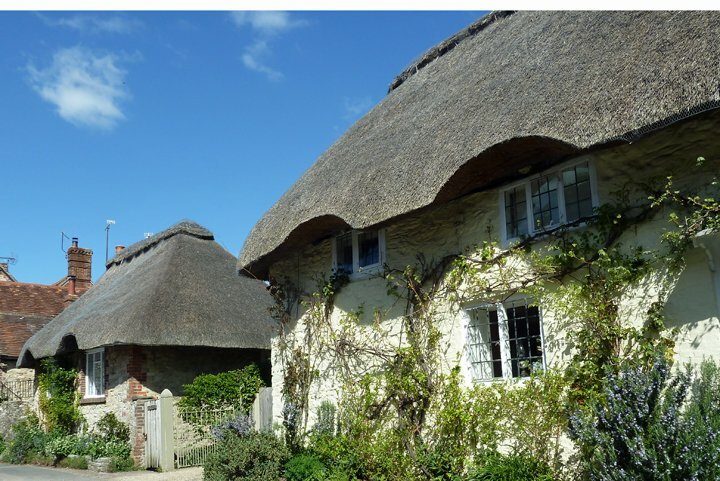 Many of the houses round here are truly beautiful, with thatched roofs and plenty of lovely old brick and tile work. You can see a couple in my photo below.